The Turbo Air K2D9000202 wire shelf is designed to fit into the right side of the Turbo Air JRF-45 refrigerator/freezer. The shelf is made of wire and has an open design that allows for airflow around products and throughout the cabinet, which helps maintain proper holding temperatures and reduce demand on the refrigeration system. The shelf is coated in polyethylene, which helps protect it against corrosion. Clips are included with the shelf for easy installation. 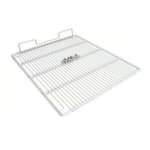 The Turbo Air K2D9000202 wire shelf is useful for creating more storage space and for replacing a worn shelf. Overall Dimensions: 24.5 in. x 24 in.